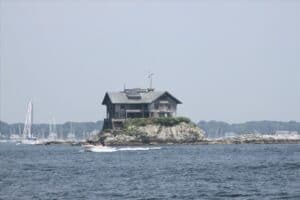 One of the most outstanding features of Newport is that it is located right the Newport Harbor and Narragansett Bay. 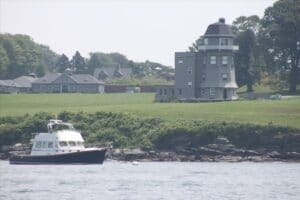 Sailing is a very popular way to enjoy the water and get to know the history and surroundings of the Narragansett Bay. We went on a tour on the 80-foot, turn-of-the-century-style pilot Schooner Adirondack II. The boat can hold up to 57 guests, and her masts reach over 70 feet above deck and have just under 2000 square feet of sail area. She is 65 feet on deck, 80 feet overall, and has a draft of 7 feet. On a high wind day, it is not uncommon for her to reach 10 knots under sail. We took a morning tour and it was nice and empty. We had lots of space to move around. Sailing is a unique type of boating experience. It is natural. It is real. Boat tours start from as early as 10:30 or 10:45. The last tour is usually at 6:45.